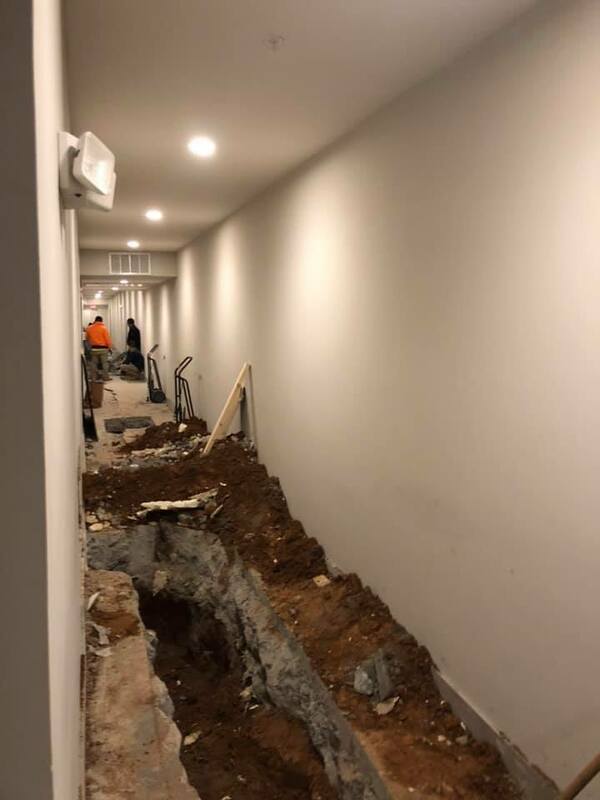 Clemson University student apartments at 114 Earle which opened in August 2017 has experienced first floor concrete cracking and settlement. Apparently they attempted to repair the cracks via expanding foam. However the crack seem to have effected more than just the floor. It looks like the sewer system may have been compromised also. Hahahah. That's amazing; talk about making a bad problem worse. I think we need to put a hold on hiring from them. What's the removal process for expanding foam in an inaccessible area like the plumbing? I've never found a solvent that worked to remove solidified expanding foam. Methylene chloride? MEK? Loose MEK is not exactly a safe and sane thing. Assuming PVC piping was used, there's likely nothing that will work on the foam that won't dissolve the pipes also. Most likely all of that sewer line will have to be replaced or abandoned, and new lines run. A roto-rooter will do it. Foam guys probably were paid by the cubic yard injected. However let's wait for an engineering report by a non-university company. A look at google street view and the History (street view) shows a lot of soil work, spread out over time, during the course of construction. Um, must of hired a bunch of freshman engineering students . 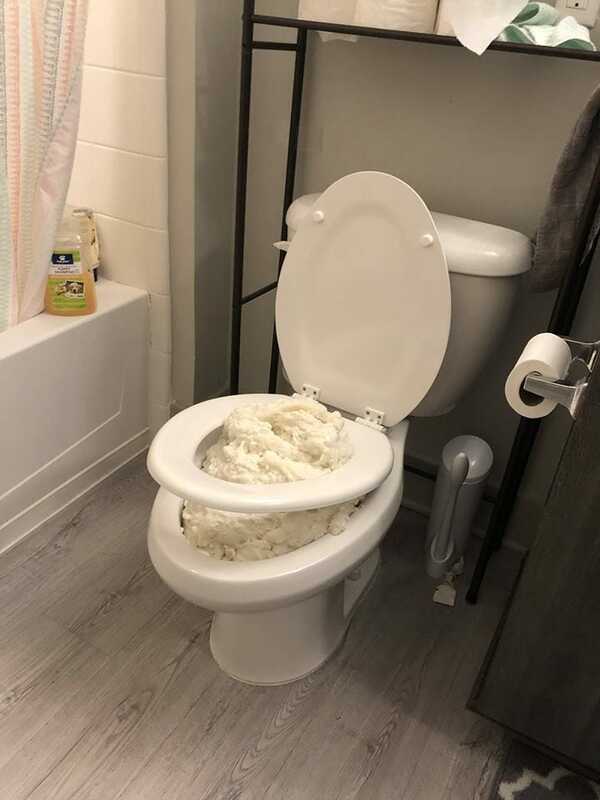 . .
Roto-Rooter might be able to mechanically remove some or most of the foam, but the inside of the pipes are going to be rough as a cob and will create nothing but problems in the future. Vents would need to be done, as well. Best bet is to tear out and replace. Somewhere the foam had to get into the lines, which means there's at least one hole in the sewer line. If it's similar to the system we've specified in the past, the injection probe had to have broken into the sewer line and the pressure near the injection site likely burst a significant length of the line. 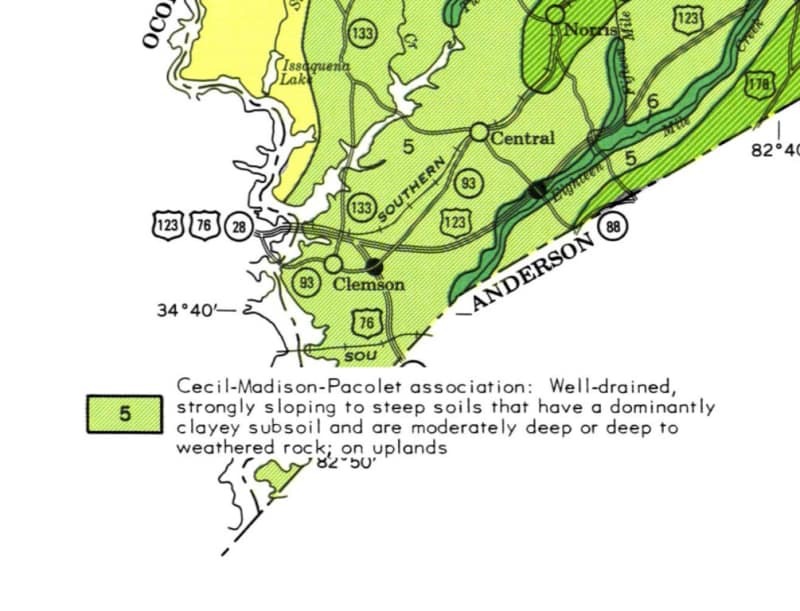 ...or perhaps a broken sewer line and loss of soil explains the original cracking and settlement of the slab. This looks like a job for the worlds smallest tunnel boring machine. I'm confused. Isn't the concrete part of the structure's.. support? How do you fix concrete cracks with some foam, especially cracks so big foam is even considered as some sort of wholesale jumbo crack-filler? I think the foam would have been intended to arrest settlement, not fix cracks in the concrete. The cracks could have partly been the result of the settlement. This is going to involve some substantial demolition. I would start at that toilet, especially if it is the only one. 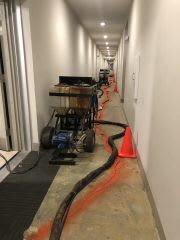 The broken plumbing line/connection hopefully is not far away. How much additional concrete cracking was "caused" by the expanding foam in confined spaces? I see Hokie. I was thinking multi-floor kind of situation. Thanks. I knew a guy who's entire business was pumping concrete under foundations to completely re-level them and the structures on top of them. Worked great and he made an absolute killing at it. 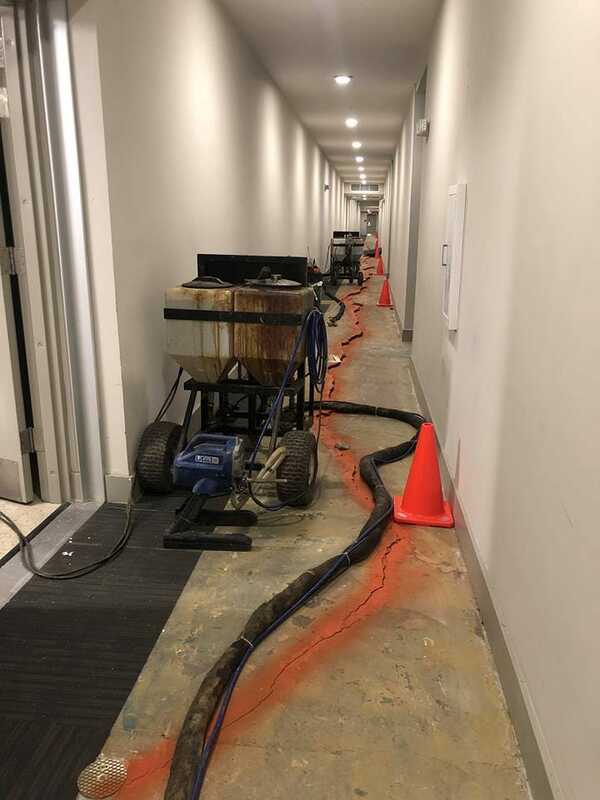 "I knew a guy who's entire business was pumping concrete under foundations to completely re-level them..."
The foam is similar, but when done by an experienced crew, can actually be more accurate. It can also be used to restore (lift) building foundations. For that, the foam is injected into the soil around and below the perimeter of the foundation to solidify the surrounding soil, then the area directly under the foundation is injected to lift the foundation. It's pretty impressive, and it only takes a few hours. Polyurethane foam mudjacking has been used in our neck of the woods for quite some time as well, with very good results. The permanency of the stuff is impressive, as long as it's not exposed to UV, as someone else mentioned. It's a real bugger to remove after errant placement. Urethane foams cure by reaction with moisture, which is why they are noted as being very difficult to remove from wood or skin (both contain plenty of moisture). I'm surprised by the foam angle as anyone who's tried to mix some polyurethane to fill a space 'just so' usually misses by a chagrined mile. To inject something then 'have it expand' and to end up with 'accuracy' used in the same sentence... I just learned something. I still envision polyurethane turning dark brown and changing to dust in a decade. Apparently, the guys at Uretek are a bit better at getting that foam 'just so' - they routinely jack slabs to within an 1/8" of their target position. Of course, underneath, it doesn't have to be any particular shape or fit within a confined area. They are using a two component material that is more predictable in terms of how much expansion and cell size is generated. Yeah epoxybot, that certainly helps. There's alot of science behind it, but the guys who do the deep injection stuff to lift slabs and foundations are still artists in my book. I didn't realize that e-pox. Thanks for that bit of education. I imagine they'd have had to visit the 'pox doctor.